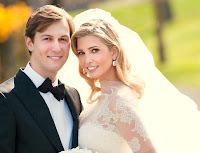 Her proposal: Customers who buy a diamond at Ivanka Trump's Bridal Bar, where rings start at $15,000, will get a three-course dinner with champagne and a night in a Trump hotel in Manhattan. Right now, the package is for the Trump International Hotel & Tower, where suites overlooking Central Park cost upward of $1,000, and Jean-Georges, where a prix fixe meal is $98. When the Trump Soho and Quattro Gastronomia Italiana restaurant open early next year, they will also be included. No word yet if the package includes a skank on the side!